How long to cook a ham varies depending on the size and type of ham. The best ham recipe requires one 8-lb ham and two cups of lightly packed brown sugar. A cured, bone-in, picnic ham works best. Simply spread half of the brown sugar on the bottom of a slow cooker, and then rub the rest onto the ham. Place the ham in the cooker and cook on low for eight hours. 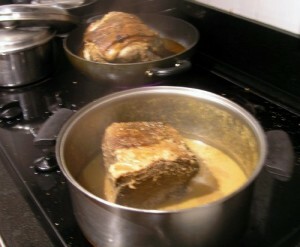 The ham will slowly cook in its own juices that mix with the brown sugar, forming a sweet glaze. This ham is perfect served with sauteed string beans and baby carrots. Pour a little of the glaze from the bottom onto the vegetables to give them a sweet flavor as well. The fat can be trimmed from the ham before cooking for those that are a bit more health conscious; the ham does not need it to stay juicy.